Great photo here of David Rosenthal, Chateau Ste. Michelle’s talented white winemaker. Making wine at Chateau Ste. Michelle is an arduous task. I can’t imagine how difficult it must be keeping organized with the hundreds upon hundreds of single block wines as they now produce four million cases of wine including one million cases of their fantastic entry level Riesling each year. 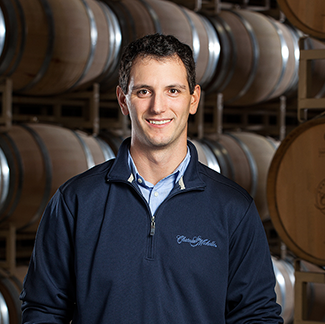 Overseeing all white wine production is David Rosenthal, who is a graduate of the University of Puget Sound. Originally from Denver, David has worked harvests in Australia and even worked in the lab at Robert Mondavi Winery in Napa. He has a wealth of knowledge and has been with Chateau Ste. Michelle since 2007 and in 2015 he was named their white winemaker. I think you will really enjoy hearing his story in wine. Here is my interview with David Rosenthal, white winemaker at Chateau Ste. Michelle. WWB: How did you initially get interested in wine? DR: My wine epiphany moment was senior year of college. A group of us thought we were being fancy and made a nice dinner one weekend and we drank a bottle of Treana, Central Coast Red blend. This was the first bottle of wine I had ever truly enjoyed. However, I don’t think I gained a true appreciation for wine until about the second or third year I worked at Chateau Ste. Michelle. I was in my early 20s and those first couple years, I was just trying to get my brain wrapped around the winemaking process. I was more interested in the specials on pitchers of beer on Thursday nights at the bowling alley than I was in the finer points of winemaking. However, after a little maturity and a few Wine 101 classes to help me understand the complexity of global winemaking, I was hooked. WWB: You hold a bachelor’s degree from the University of Puget Sound. How did you decide to move from the Pacific Northwest to Napa and work in their lab? What was that experience like working at famed producer Robert Mondavi Winery? DR: After college, I was waiting tables in my home town of Denver. I was looking to use my degree in marine biology, and a college friend who was working in a tasting room in Napa suggested I apply for a harvest lab position at some wineries in Napa. It was just before harvest, so most wineries were still hiring. On a whim, I sent out of few resumes, and Robert Mondavi winery hired me the next week. I drank enough wine in college to know the difference between Cabernet and Chardonnay, but it occurred to me a couple days before I drove from Denver to Napa that I was not 100% sure wine came from grapes. No joke, I read Winemaking for Dummies while my Dad and I drove out to California. My initiation into the wine industry could not have been more spectacular! I may have been reading Winemaking for Dummies on the way to Napa, but even I knew who Robert Mondavi was and how important he was to the wine world. During the 2001 harvest, when I worked there, the granddaughter of Margrit Biever Mondavi was also doing a harvest lab internship. She was staying with Robert and Margrit at their home in Stag’s Leap. On two different occasions the entire lab staff was invited up to the house for dinner. Robert and Margrit were always on the go, but they were gracious with the time they had, and they were fabulously interesting people. So, my introduction to the wine business was drinking wine with Robert Mondavi in his living room (which had a full-sized pool by the way). WWB: What was it like working for Domaine Serene under superstar winemaker Tony Rynders? How did their world class white wine program prepare you for being Chateau Ste. Michelle’s white winemaker? DR: I worked for Domaine Serene in the fall of 2006. In the Spring of 2006 I worked harvest in the Riverlands region of South Australia for a winery so big, it would make Gallo blush. So, the juxtaposition of that experience and working at a small ultra-premium producer was both startling and highly educational. First, Tony and Drew Voit (associate winemaker at the time) had an incredible attention to detail. Everything to be done, needed to be done correctly and precisely. Second, there is a culture of winning at Domaine Serene that I have never seen anywhere else. That is a strange thing to say about a winery, because wine is so subjective no one winery can ever “win”. However, they demanded the best and they expected to make the best wines in the world. They remind me of the New England Patriot’s winning culture and some people liked it more than others, but everyone respected the quality of the wines. So, working at Domaine Serene taught me that there is no excuse for cutting corners, expecting anything but the best, or for not trying to make the best wines possible. Even though we are a larger producer, we use many of the same principles as Domaine Serene, we just have to repeat the process a few more times each harvest. WWB: You make dozens of white wines for Chateau Ste. Michelle and craft some of the best value white wines in the United States, like your seriously good 2016 Chateau Ste. Michelle ‘Indian Wells’ Chardonnay (WWB, 92). What are some of the challenges with creating so many wines? DR: First, thank you! I take a huge amount of pride in our team’s creation of high quality, value wines. Second, Washington State is a rare growing region because we can grow such a diverse array of world-class grapes and create multiple styles within each variety. Winemakers in a candy store! Third, Chateau Ste. Michelle affords its winemakers a unique opportunity. We get to make wine that people can afford to drink every day so that wine can become a bigger part of their daily lives. We also get to geek out and make small production, artistic, and sometimes off the wall wines for our wine club that satisfy our desire to explore winemaking. I think both types of wines are equally important. Having said that, it truly takes a team working with the same set of values and principles to make great wine. Every vintage, heck every day during harvest presents a unique set of challenges. The challenge is listening to each block of grapes or each fermentation and allowing the wine to be what it wants to be. Then, it takes a seasoned and dedicated team like ours to know how to properly react to those sounds and put in the extra effort because it is the best thing for the wines. WWB: When you are not enjoying Chateau Ste. Michelle wines, what are some of your favorite wines and producers of the world? DR: I love German Riesling. Dr. Loosen, Donnhoff, and Maximin Grunhaus are some of my favorites. After that, my wife and I drink a lot of Pinot Noir and wines from the Rhone Valley. From Oregon wineries such as Cameron, from Burgundy we like Caroline Parent, and from the Rhone you can’t wrong with Chapoutier.